Nine workers were injured after a fire broke out in a three storey nail polish factory in outer north's Bawana industrial area on Friday morning, police said. 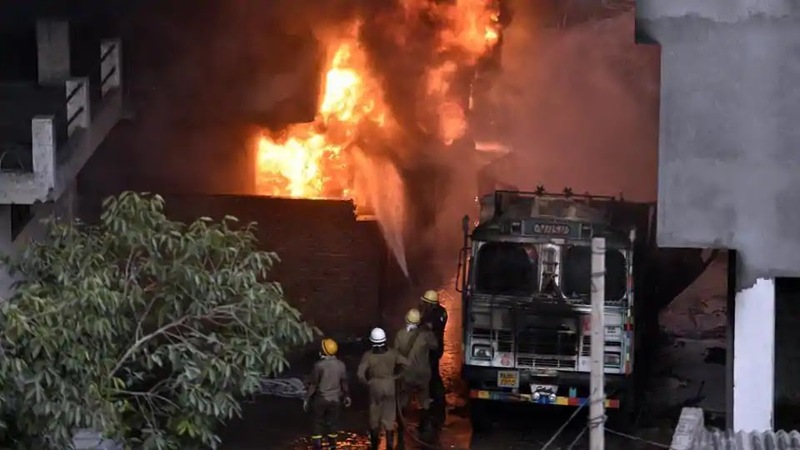 A call about the fire was received at 2.48 am, after which 12 fire tenders were rushed to the spot and the blaze was brought under control by 5 am, a senior officer of Delhi Fire Service said. The fire officer said it appears that the fire broke out in the basement and spread to the rest of the building, he said. The injured were rushed to Maharishi Valmiki Hospital where they are being treated for their burn injuries, Deputy Commissioner of Police (Outer North) Gaurav Sharma said. The officer said one of the injured sustained around 40 percent burns. The others sustained minor burn injuries. A case has been registered and the factory's owner, Hemant Bhagwani (34), was arrested, police said. The workers were on night shift when the fire broke out. During investigation, the workers told police that the fire originated from the exhaust fan and soon engulfed the entire building, Sharma said. Police are verifying whether the factory was functioning legally and if it had fire fighting measures in place, Sharma added. The incident comes days after 17 people were killed in a fire at a hotel in Karol Bagh.